Sometimes you’ve just got to treat yo’self, and whilst some people might treat themselves to a new lipstick I seem to take it to the next level and here we are now, god knows how much poorer but hey new makeup makes it all worth it. Although I should really be Christmas shopping (for others, not myself! ), I’ve been having the migraines from hell the past couple of weeks which lead to me justifying a ‘little’ online treat, but the most annoying thing has been that I’ve been too ill to even wear makeup and having all this makeup sat untouched is KILLING ME. Luckily I’ve been starting to feel more myself the past couple of days as I’ve been put on new tablets so I can’t wait to get back to wearing a full face of glam! It’s so strange not spending time at my dressing table covering my face in as much sparkle as I possibly can, but I needed the rest. On the plus I’ve had time to rewatch Pretty Little Liars (for the 4th time) and it’s giving me all the feels. I’m not ready to say goodbye to it next year. Okay I’ll stop rambling now… on with the haul! Starting off with the best bit, MAC. The first thing I picked up was actually a skincare item that I’ve heard lots about, Complete Comfort Creme. Now the cooler weathers here I was looking for a new moisturiser to keep my dry areas under control, and this really stood out to me. I have actually used this a few times (no matter how ill I am, you can’t keep me from my skincare!!) and I’ve really been liking it. It’s hydrating without being greasy, and I love how smooth this leaves my skin feeling, expect a full review once I’ve given it more of a try! Up next is a product from their holiday collection, which I must say is absolutely adorable this year! With pink being my favourite colour this collection captures my makeup loving soul and I’ve had to tame myself to just buying the one product. 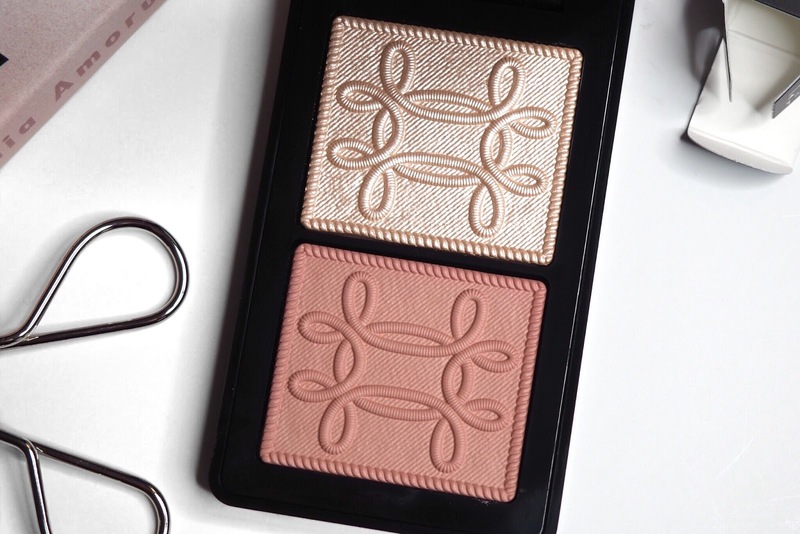 The one thing I did pick up was the Nutcracker Sweet Peach Face Compact, they actually have two colour options but I couldn’t see myself using the other one, and the highlighter shade in this duo made my heart almost stop beating… gimme all that glow. I also decided to pick up a couple of new lip products, both of which have sat on the top of my wishlist for a good while now. The first was Stone Lip Liner which is a greyish taupe, I wanted something with a more grungy feel to it as it was something missing from my lip liner collection. To go with it I also picked up Myth Lipstick, I feel like it’s been forever since I bought a MAC lipstick and I’ve heard it pairs perfectly with Stone for an ombre lip – I just can’t get enough of ombre lips lately! I then decided to give the Half Lash Curler a try because my awkwardly stubby little lashes are a nightmare to curl. It’s so adorably sized and I can’t wait to give it a try. When I saw a 20% discount for Look Fantastic in my inbox I made the most of it and finally purchased two base products that I’ve wanted for a while. The first is the glow giver that’s very well loved in the beauty community, the Nars Copacabana Illuminator. I wanted to see how this compared to my beloved MAC Strobe Cream that I’ve recently run out of, and from the swatches this is a hell of a lot stronger as far as glow goes but I’m hoping I can make it work underneath my foundation as that’s what I really wanted it for. I’ll update you all on how I get on soon! Because one new base product wasn’t enough, I also picked up the Hylamide Transparent Photography Foundation. I’ve heard a few good things about this, but when I saw the makeup queen Caty post about it I instantly realised I needed it in my life asap. It’s basically a primer aimed at perfecting the skins appearance for the camera, and for somebody who photographs their makeup pretty much daily this makes me excited just thinking about it. Sometimes the camera isn’t the most flattering on makeup, and it seems to pick up pores you didn’t even know you had so I can’t wait to give this a try. I’m expecting miracles here guys. Last up I picked up a few new lip products from NYX. Whilst they’ve recently opened a counter in my local Boots, it never seems to be stocked so I had to place an online order to pick up these little gems. I picked up 3 of the Liquid Suede Lipsticks in Soft Spoken (a warm toned mauve), Brooklyn Thorn (a deep brown) and Alien (a black with a slight blue hint). Whilst the first two are on the more wearable side, I wanted a super dark option for more creative looks. 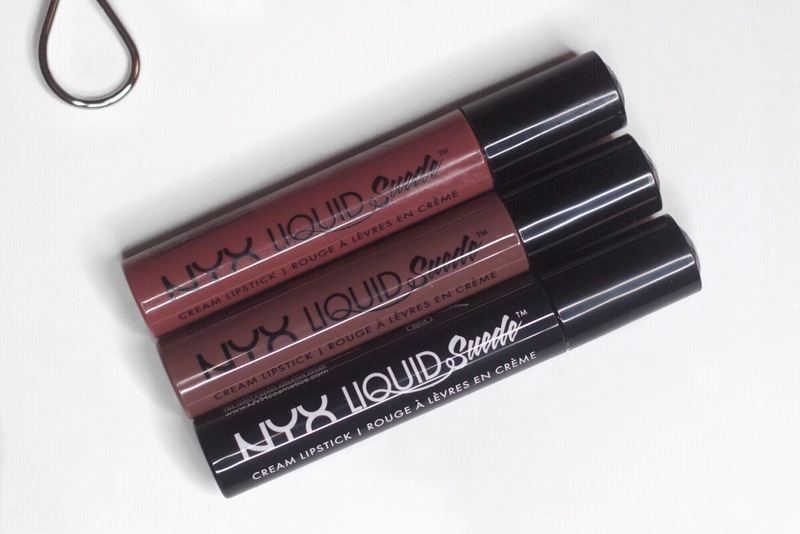 I really like the Liquid Suede formula and I find they look really good especially in photos. A lot of liquid lipsticks can feel dry and emphasise every line on your lips but I find these fine. I did actually order one of the new Cosmic Metals as well but they accidentally sent me another Brooklyn Thorn Liquid Suede which I’m gutted about! I can’t wait to swap it for the right shade as metallic lips are everything lately, I love how they look! I’ve also got my eyes on a few of the Full Throttle Palettes so I may have to place a little order (oops), but Color Riot and Bossy have my name all over them – I’ve been absolutely loving NYX lately! So that’s everything I’ve picked up lately. Seeing the box of products sat on my desk waiting to be used is torture, at least the photos are done so it’s all ready for me to use. Expect lots of new makeup looks and reviews soon! Hope you’re all well!